being a company based in Milwaukee (offices in CA too), you somehow find ways to explore your city. For us, it’s really hard because we travel so much and spend more time in other cities than we do our own. So the other nite my wife and I set out on a mission to explore Milwaukee on our bikes. Really, we just wanted to do a long ride and try a different route than our normal ‘go south-ward’ out of the driveway. here is what we found…An amaing 100 mile route thru Milwaukee county call the Oak Leaf Trail. it was fun and beautiful all at the same time. The trail is well marked…oh all paved trails too…and takes you thru some of the neatest parts of Milwaukee. The route will take you thru some county parks that might be off the beaten path, past the lake front, which is simply beautiful, thru some neighborhoods that will take your breath away and simply help you to appreciate the entire city of Milwaukee. my wife and i did about 26 miles of the trail and often found ourselves saying: ‘hey, this is so cool, i didn’t know this was in our city!’ We found some new restaurants, new parks and best of all a new coffee shop. note that this trail isn’t just designed for bikers, so be aware and courteous of walkers, runners, owners of pets and those pushing babies! Categories: Cyclelogical, Sight Seeing | Tags: biking, Milwaukee, Oak Leaf Trail | Permalink. We wanted to give a shout out to some of the talented people who help design our shirts. This month we are giving a high five to Tara Scheuerman from Milwaukee. Tara has been designing for us for over a year. She worked as a freelance photographer after college and then started a greeting card and design company shortly after. I live in the Bayview neighborhood of Milwaukee, which is the most awesome area ever! It has a lot of local shops and boutiques and cozy little restaurants and super cool bars. I love just discovering this area with my husband and we frequent the local coffee shops, especially Stone Creek Coffee. I also love all of the local micro breweries in this area, because I love beer! Since I work from home, I don’t commute to work by bike. 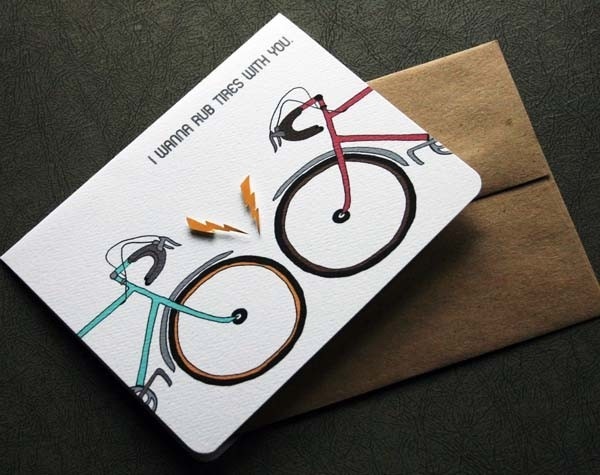 But I do like to bike to the farmers market & other places in Bayview during the summer with my husband. We also like to bike along the lakefront. I’m currently pregnant with my first baby, so I am looking forward to biking around Bayview with my baby this summer! Be sure to check out more of Tara’s work on her blog and etsy. Categories: Uncategorized | Tags: artist, graphic design, greeting cards, Milwaukee, stone creek coffee | Permalink. 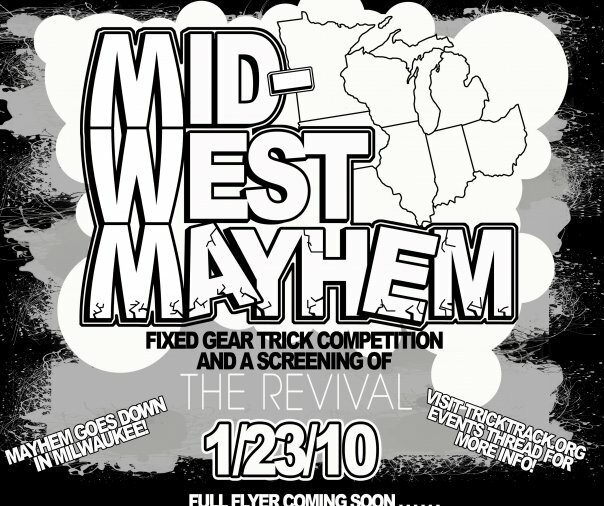 It’s the Midwest’s screening of The Revival, a fixed gear bike movie. Events will also include a trick competition, gold sprints, footdown, and other fun stuff. It will all be held in an indoor warehouse in Milwaukee, WI. What: Premiere of The Revival, Various bike competition afterwards, held at a different location. Categories: Cyclelogical | Tags: fixed bikes, Midwest, Milwaukee, screening | Permalink. We have a cyclelogical fan (Josh) in Milwuakee who lives in a “community house” where everything is shared from meals to cars. Josh is an avid commuter and talks about his commuting and community lifestyle. Tell us about the community house? each other through our life adventures. What do you guys share? TV and Wii are a bonus too. brave the frozen tundra of Wisconsin. 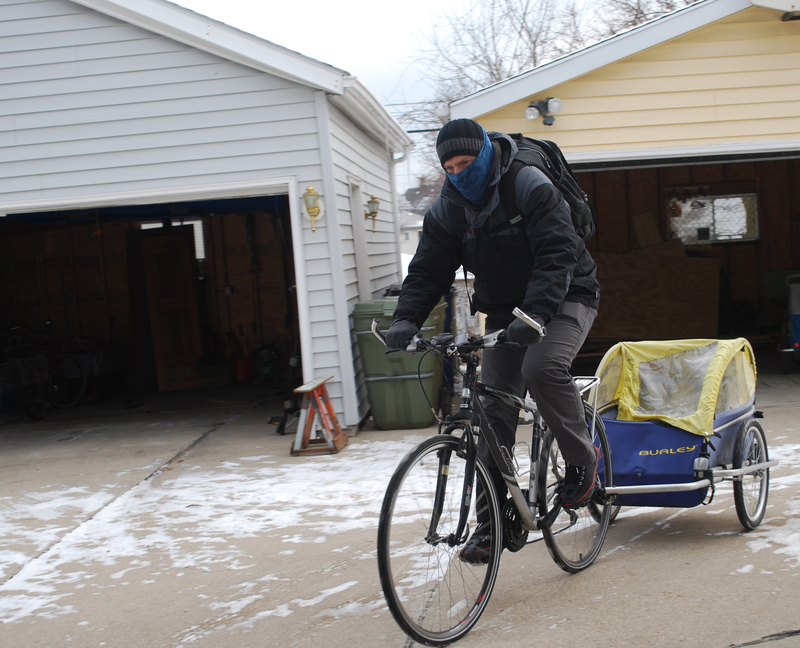 How much do you commute with your bike in the winter months? end up walking to work to save the wear on my bike and to avoid the crashes. amount of time in the cold. 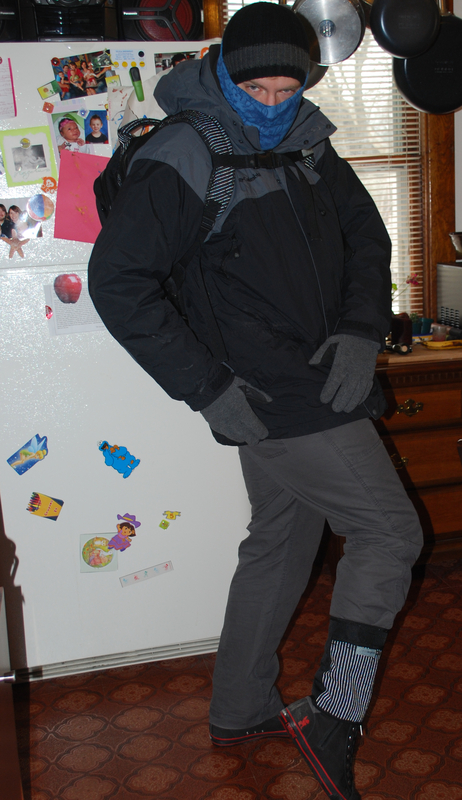 sure that you wear warm shoes or boots, and change at work if you need to. always good to have the ability to increase my visible presence on the road. What are some obstacles you face commuting in Milwaukee? What products from cyclelogcial do you have? And how do you use it? cuffs and expose my ankle to the elements. Favorite bike trail in Wisconsin and why? and oh so much fun. Categories: Uncategorized | Tags: community house, commuting, Cyclelogical, Milwaukee | Permalink.